LET'S Collaborate for Creativity — STEAM Co.
Are you a school that would love to have a STEAM Co. Day but don’t think you can afford it. And need some help. Are you a creative person or company that would like to connect with schools and help them inspire their children with creativity? Our #CollaborateForCreativity campaign is all about helping you both, to connect and run STEAM Co. Days - our mini Creativity Festivals run in Primary Schools by school communities. Read more and sign up below. We don’t want to be too alarmist, but like many educators, industrialists, artists and parents we’re very worried. STEAM Co. was co-founded 8 years ago by a group of parents, teachers, artists and other carers in a primary school in Paddington to Power Communities to Inspire their Children with Creativity, by providing the Inspiration and Resources to help them run STEAM Co. Days - mini Creativity Festivals in schools. 3 years ago one of the dads gave his career up to roll it out to every school in the UK via launch events and UK tours. Everywhere we’ve gone, from North Cornwall to Northumbria, London to Liverpool, we’ve had a fantastic response in State and Independent Schools, though many schools say they wouldn’t know where to start, can’t afford to get us in or don’t have the community skills and support they need. We need to help them as we’re passionate that creativity is a crucial skill our kids will need. It’s under pressure in our schools, in fact we’re worried we’re facing a creativity crisis. We’re connecting school communities to make a difference. Do you care? Will you help? Inspired by HRH’s ‘Arts for Schools’ event we launched a campaign #COLLABORATE FOR CREATIVITY to connect more Creative People and Companies to connect. 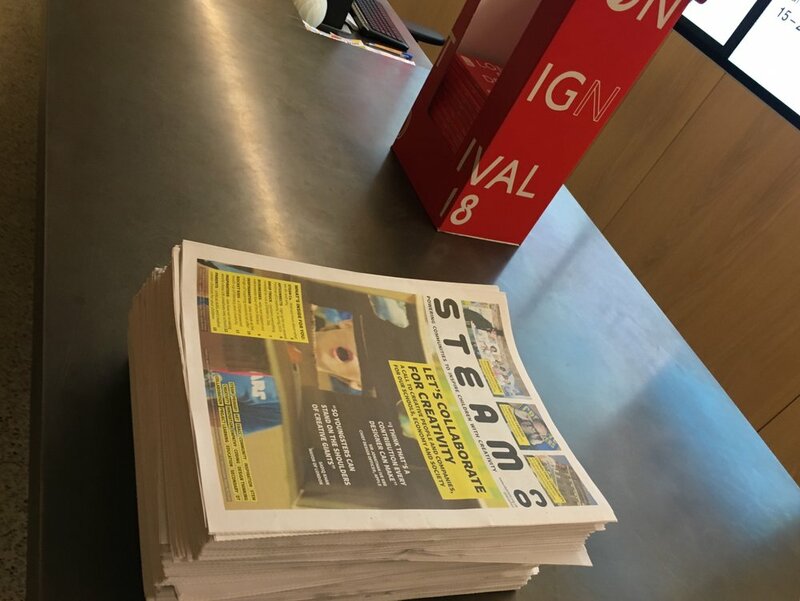 Yes, we’ve only gone and published 5,000 newspapers showcasing creativity in school communities across the UK for London Design Festival and beyond. We’re delighted to announce the second #ARTCONNECTS Festival of Creative Schools, Work and Lives - a week across the UK in 2019. Whether you’re creative company like the one in the film below that is keen to help run a STEAM Co. Day or a School that would love to have a STEAM Co. Day but wouldn’t know where to start or just can’t afford it, get in touch on the form here. Creative Person - while we’re keen to hear from creative people there’s something everyone can do to help inspire a child on a STEAM Co. Day. Do sign up here to help or to hear from us. Creative Company - would your company send some staff to help run a STEAM Co. Day, would you pay for one (£750 or so) or would you sponsor STEAM Co. (We need to get more of our Drop Trucks on the road). Sign up here. We’ll be in touch. You may be a creative keen to help on a STEAM Co. Day or know one of the UK’s world class creatives that might be interested in spending a few hours as an Inspirator, developing an activity pack that can be delivered on STEAM CO. Days by school communities across the countries 31,113 schools. Inspired by a call to arms by HRH Prince of Wales/Duke of Cornwall* at his milestone 'Arts For Schools' conference (see film below) this campaign is a call to arms to creative people and creative companies to work with us using our STEAM Co. Day format in schools across the country. With drastically fewer young people choosing GCSE’s in arts and creative subjects and teaching training applications down yet booming creative industries that need these skills, something’s not right. Some point to educational policy such as the EBacc that prioritise non creative subjects, others say we need to educate parents and teachers. Some even think we need to rethink education itself. Any ideas yourself? You may be worried as a parent yourself, or just care. Care about our children, creativity and all our futures so we want to hear from you, especially if you don't have kids yet or they've been and gone or you aren't having them at all. This a chance work with with schools in all sorts of communities, some where parents or other carers can't always be called on. See films below that give you a snapshot of what we do and need to do and another of a typical STEAM Co. Day run by 'Your Favourite Story' a digital product launch agency in Shoreditch who generously hosted this event. We heard from some wonderful speakers and guests, one who travelled form Bradford. Full write up and films follow. Jade Wilson - Young Digital Designer with no kids yet. We’re delighted to announce the second #ARTCONNECTS19 Festival of Creative Schools, Work and Lives. See this snippet of last year’s performance by a Science Teacher and Soul Singer, Winnie Greer. So sign up here to be sure you get the updates and 3 minute video blogs of last years event as we release them. Take a look at the film below which will give you an idea of how we help communities to collaborate with schools and see how a creative agency - Your Favourite Story - from Shoreditch took a day off to run one of our STEAM Co. Days in Raynham Primary, a school in a very challenged community nearby in North London after hearing their head teacher say that “Creativity is a Luxury” at an event we held with Barclays in Canary Wharf. Have a look at what they do with cows on the roof at their studio in London’s Shoreditch Creative Quarter when they aren’t lending it to creative community enterprises. We’re very grateful for Your Favourite Story for hosting this evening event. They’re the perfect example of an albeit small creative agency that is bursting with both generosity and ideas to help their clients launch new products. Pop your details in the form below and we’ll keep you posted on how the evening went and where we go from here.